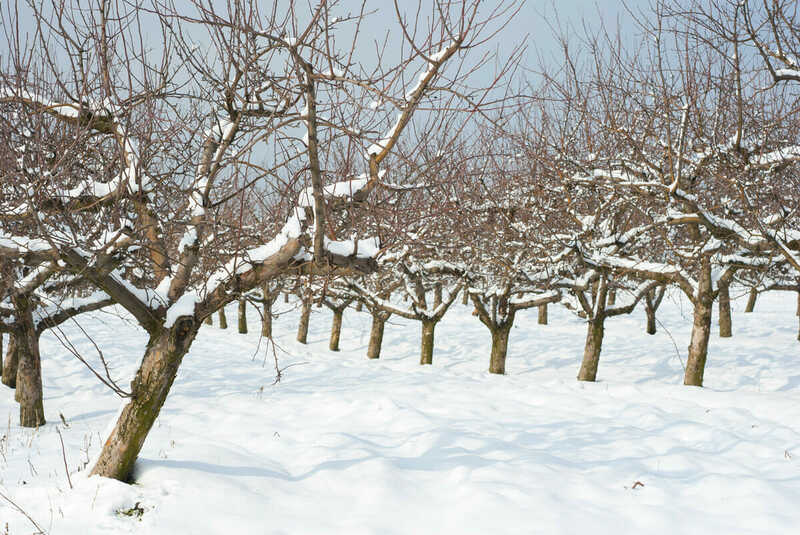 A simple way to prune your fruit trees during the winter. Within a few years of lovingly planting fruit trees, most folks find themselves with scraggly overgrown bushes, rather than the Garden of Eden they had envisioned. The key to keeping fruit trees attractive and productive is annual pruning. Worry not, pruning is not the brain surgery it has been made out to be. Curmudgeonly Master Gardener types may tell you that different fruits are pruned in different ways, which is true to an extent, but there is a simple three-step process that works for the vast majority of fruit trees. Outside of the tropics, most of us are dealing with pome fruits (apples, pears and quince) or stone fruits (peaches, cherries, apricots, plums – anything with a pit). This three-step method works for both. Though summer pruning is not harmful to the trees, winter makes things easier. Without the tree’s foliage, you can really see what you are doing. Start by pruning away any wood that is dead, damaged or diseased – a.k.a. the three D’s. Are sprouts coming from the base of the trunk? If so, remove them – technically they’re called ‘suckers’ and they originate from the rootstock rather than the fruiting variety grafted on top. How about suspiciously straight sprouts growing from some of the main branches? These erect, perfectly vertical branches, or “watersprouts,” – should be removed as well. 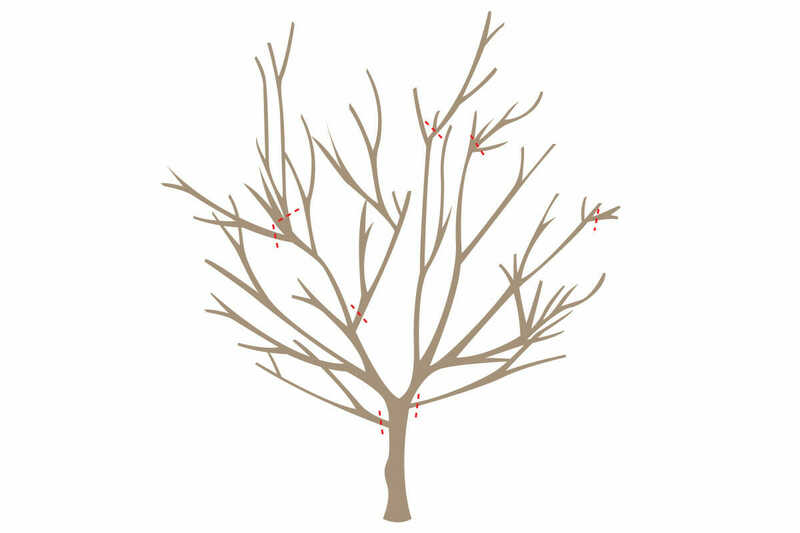 With all these clean-up cuts, it’s important to prune the branches back flush to the larger limb they’re growing from – don’t leave little stubs. The goal of thinning is to allow light and air into the canopy, which boosts fruit production and reduces problems with pests and disease. First, remove any branches that grow downward, toward the center of the tree or that cross paths with another branch. Once these are out of the way, stand back and take a look. The goal is to have evenly spaced branches splaying out in a pleasing, fractal-like pattern from the center. 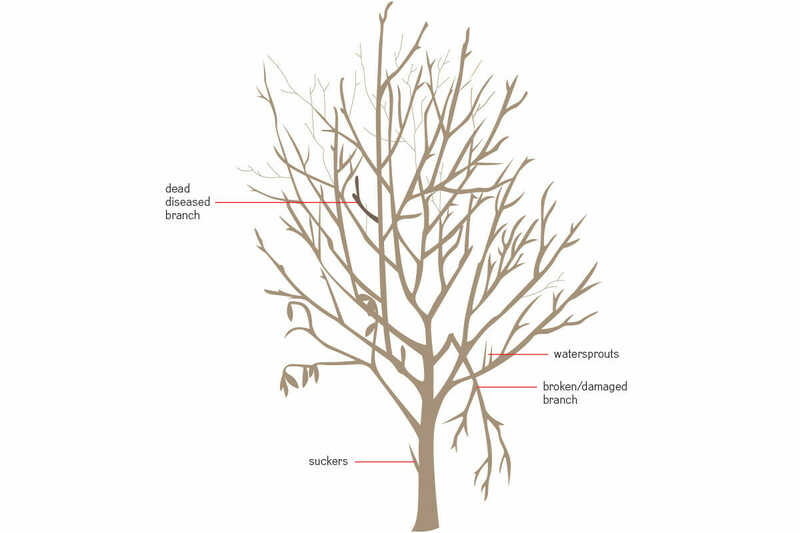 Do you see places where multiple branches compete with each other? You might find two or more growing from a single crotch at a narrow angle, for example, or from different points but in a parallel fashion, one hovering over the other. If so, thin out all but one branch, retaining the branch with the healthiest appearance and best crotch angle (roughly the 2 o’clock or 10 o’clock angle from the center of the tree). Wider angles can break when laden with fruit and narrower angles lead to bushy growth and fruit that is too high to pick. Next, continue to thin the tree until there is a good 6 to 12 inches of air space around every branch. The smaller the branches are, the closer they can be to each other. As with your clean-up cuts, all thinning cuts should be made flush to the branch. The last step is the easiest – you’re basically giving the tree a haircut. The idea is to prune back the outermost growth of the tree so the branches become shorter and thicker as they grow, rather than long and gangly. This keeps them from snapping under the weight of the fruit, but pomologists (fruit scientists) will tell you that it also causes the tree’s hormones to activate growth lower in the canopy, making for smaller, more fruitful trees. Heading back the tree means cutting off 20 to 30 percent of last year’s growth. You can distinguish last year’s growth from two-year-old growth by the wrinkly ring of bark encircling each stem. Depending on the vigor of the tree, this may be anywhere from two inches to 4 feet back from the tip of each branch. Unlike the previous steps, these cuts will be made part way into each branch. Exactly where you make the cut is important, too. Prune each branch back to a point one-quarter inch above a bud that faces the direction you want that branch to grow in the coming year. 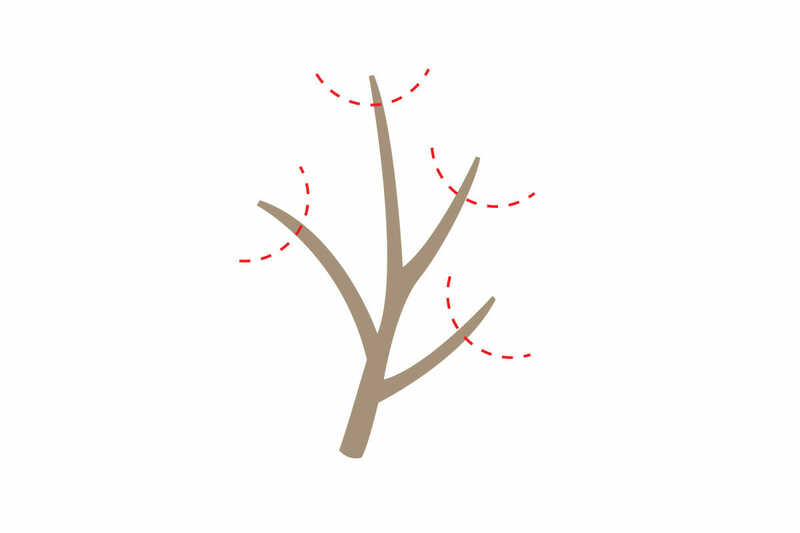 If there is another branch close by on the left, for example, prune back to a bud on the right side of the branch. Brian Barth formerly lived in America’s fruit basket, aka California, where he ran an edible landscape design company, but moonlighted each winter as a fruit tree pruner. is the news letter free. Thanks for the tips on pruning fruit trees. I’m gong to jump in and try it for my self on all 20 trees in my yard. You can use NEEM oil.